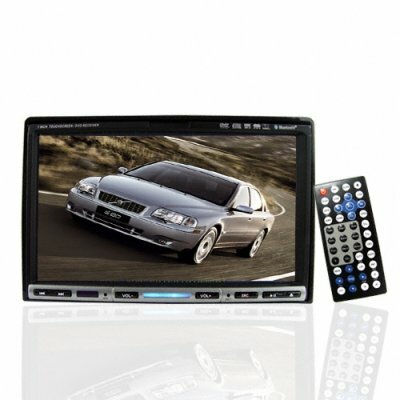 Successfully Added Powerful 2 DIN 7 Inch Touchscreen Car DVD + Bluetooth to your Shopping Cart. Are you tired of all the flashy "brand name" car DVD's that cut corners on features but still cost ridiculous prices? Take a look at this unit; massive 7 inch touchscreen, Bluetooth, IPOD, USB and SD Input, and 4.1 channel preouts. What an incredible range of features for a unit at this price. This has been a constant customer favorite because of its quality build and attention to detail that ensures end-user satisfaction from even the most discerning car AV aficionado. Details like a USB female fly lead that can be routed through to the glove box so that your expensive MP3 player is kept out of sight as well as a structurally sound faceplate slide that removes annoying rattles on those epic driving journeys really show the fine design details put into this unit. This is a great system at an even better price and is accompanied by our famous 12 month warranty, so why wait any longer to get it? In stock in our warehouse right now, order yours today at our excellent factory-direct wholesale price and have it installed in your vehicle by next weekend!